Feast your eyes on the Nevis family hamper brimming over with a fine selection of Scottish foods and drinks – an ideal gift for a large family gathering. Red and white wines, Scottish tea and coffee, award-winning smoked cheeses from Arran, oatcakes, smoked salmon and dill pate, fruity clootie dumpling and haggis, alongside traditional Scottish soups. Family favourites Tunnocks caramel logs and caramel wafers feature with Walkers Dundee Cake and Old Fashioned Ginger Cake. Walkers Shortbread fingers nestle together with Mackies chocolates and a selection of biscuits baked in the Borders. For even more sweetness, there is Galloway Luxury Strawberry Jam and Mrs Tilly’s Luxury Vanilla Macaroon. Then to balance, new artisan products including Little Herb Farm Tarragon Vinegar which is perfect with salmon and Hebridean Peat Smoked Sea Salt. 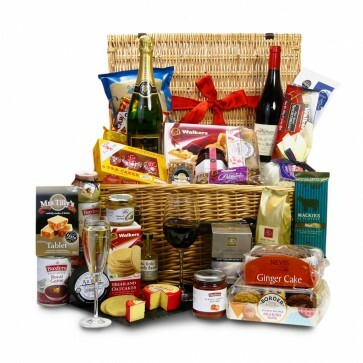 The XL Nevis Hamper is beautifully presented in an elegant wicker hamper with a hand tied bow. Remember, please tell us what you’d like written on the personalised gift card included inside.